Today I noticed tiny dimples at the top of each finger on Caroline's little hands. Just something about her blue eyes, gentle spirit, sweet smile and perfect lips made for baby kisses. For some strange reason, I couldn't stop thinking about it. So I went back to take the picture. It's obviously hand made, and the fluorescent orange paint is made to draw attention. Do you think it's for drivers or visually-challenged people? Does it mean, "Stop! Blind people!"? Can the blind person read the sign? I noticed the sign is placed at a crosswalk where there is already a traffic light. Therefore, if a blind person wanted to cross, the cars should already be stopped. I'd like to think that if a blind person was crossing the street, drivers would be paying more attention to them than the sign, i.e. they'd already be stopped. But I guess you can never be too careful. I noticed today that I was wearing a little tiny boulder on my shoulder. First of all Sweetie pointed out to me some unauthorized (or so we thought) transactions between our old checking account and the new savings account I opened yesterday. "Don't get me started," I told him, as my blood began to boil. It's like Pavlov's dogs. You say something about money and I salivate. Not in a good way. More like a werewolf with rabies. Then I went to visit Mary. Last night she told me she had not been bathed in over a week. Even after the whole towel fiasco, I laced up my boxing gloves before visiting entering the "care" facility. Had I learned that Mary had still NOT received the shower promised on Sunday, I planned to go straight to the executive director who I noticed was in his office as I passed by. The good news is she did have a shower - mostly a cool trickle, but she got somewhat clean. The bad news is the bruise I saw on her leg. Don't get me started! Later I found out that my insurance company has some new way of paying, or NOT paying, for Rx's. It makes no sense to me. Mostly it irks me that nobody bothered to tell me of the "tiered" pay scale. I knew it wasn't the pharmacy's fault, so I tried not to let the steam coming out of my ears whistle like a tea kettle. My point, if I have a point, is that while I feel today's gripes may be reason for some action, in the big scheme of things, I need to chill out. While I was on FB, I came across a petition to be signed. In the big scheme of things, this is really BIG to me. There's a line in a country music song that goes something like: "You've got to stand for something or you'll fall for anything." I can remember my friend and co-worker, Pam, coming into our office several years ago singing that song, over and over. I can't remember now what stand she was going to take, but the words motivated her to more than just sit there and fuss. It's been almost a year since this Malala Yousafzai was shot and left for dead by the Taliban. I'm not sure where the time has gone. But I'm sure Malala and her family could tell you how she's spent each and every day since then recovering. And if that's not enough, she's still fighting. 16 years old and such a warrior for the rights of women. As Malala's bravery points out, education for women is not just an African or Afghan problem. It is a universal one. I have to ask, how many girls have to die, and how many patriarchal societies are going to allow it, before the world stands up and says enough is enough? Malala isn't sitting around waiting. She's taking her fight to the United Nations. I swear I get goosebumps thinking of that woman/child addressing the UN. Some of us are born for greatness. Some born to stand back and cheer them on to victory. I'm cheering Malala on, and asking you to do the same. On July12, Malala will mark her 16th birthday by delivering the first-ever set of education policy recommendations written for youth, by youth. I just signed this letter to the UN Secretary-General telling him, and the world, that Malala does not stand alone in her fight for universal youth education. Will you sign it as well? Thank you for supporting this cause with me. Every signature really does make a difference! What makes you stand up and shout, "I'm not going to take this anymore?" I noticed today how grateful I am to Weneki for turning me onto chicken salad for lunch. It always seemed so much trouble to make. But it's not really. And I noticed how just a smidgen of curry powder adds the right zing to the salad and never fails to remind me of my mother. Do you have a favorite food that reminds you of someone? I guess Father's Day and the lack of a father got to me more yesterday than I thought. I started twice to write a post about fathers. When interrupted I didn't go back to them. And I'll be honest all those daughter and Dad photos on FB made me feel like a little kid sitting on the edge of the sidewalk pouting cause she wasn't picked to be on anyone's team. I don't think it was overt pouting, more like an icky feeling under the surface percolating. Feeling resentful of people who still have dads is about as childish as it gets, don't you think? Ahhh, childish. Now I get it. As I was typing out the word childish, I had a vision of Carolyn sitting alone and feeling sad. Well, I'm just going to have to do something about that. Come, dear girl, sit on my lap. Let me hold you and rock you and snuggle up close. No we don't have our Daddy here anymore. And it's scary and sad. Here's what we do have. Yeh, I know some of those memories are scary and sad too but let's not go there tonight. What's something you remember that makes you smile about Dad? How he liked to drive down to Huguenot Park and watch the waves slap against the beach. Or what about that time we went to Red Lobster and he ordered a lobster in honor of mama, and ate the whole thing! And that time he sat at the Veteran's Wall in his wheelchair. Remember how we left him alone with his thoughts and watched him as he read off names. I doubt he knew anyone whose name was on that wall. But he had so many other names to remember. I wonder if it was like a news real going backwards the way they used to do at the movie theaters. Much as it drove me crazy, I smile when I think of Dad's plans and preparations. He didn't say it often, but he was proud of us. He loved us in his own way. Don't cry, Sweetheart. We're going to be okay. How about we go walk the dog? I noticed how writing this made me feel better. I read a FB post today by Josh Urban. I think I've mentioned him before. He's Terri St. Cloud's son who has been traveling as a one man goodwill ambassador. He's supposedly looking for all the good out there in the world, that people tend to overlook. My guess is, that as he visits hospitals, plays his music or makes motivational speeches at elementary schools, Josh is as good as any other good he can find. And that's what makes his mission so great. He's not calling attention to himself. He's pointing the light on others. I was on The Cardinal, heading south to Charlottesville, when I wandered up into the lounge car, sat down, and got into a conversation with a Vietnam vet. He said after 'Nam, he was stationed on an ammo ship in France. "You know those old wives tales about rags starting fires? Well, they're true." With the blaze broke out on board, he and the rest of the crew went to flee the fireball that the ship could easily become, but the MP's forced them at gunpoint to start the engines and head out to sea. "We went out so fast, we were still tied to the pier - we ripped it right off and dragged it to sea." Thankfully, they put the fire out, and a crater in the bottom of the ocean was avoided. "One blew up in the fifties, and they found pieces twenty miles away." Man, it sure is cool to talk to folks! How do you get people to talk to you? Do you just go up to them and say, "Hi, I'm Josh, what's your story?" I'm sure Josh is way cooler than that. But I wanted to know if he makes a formal introduction then hits people up with 20 questions, which is sort of my style. I've been accused of being nosey, so maybe my style needs some work. "This one was fairly easy, Mary. I sat down at his table in the lounge car, introduced myself, and noticed his hat. I usually ask fellows about their military hat, as I figure they wear them for a reason. He just started, and I sat and listened. It was great!" I'd never thought of the hat trick before. I'd probably be afraid to ask about some of the hats that men wear around here. Southern Style ball caps. You know the ones made of camouflage that are supposed to trick innocent deer into walking within blasting range of a 12-gauge shotgun, or advertise Copenhagen snuff or John Deere tractors. I'm not sure how long I could listen to hunting stories coming from a man a-chewin and a-spittin. I am, however, going to start paying more attention to hats. Maybe I'll get up the nerve to ask. How do you strike up a conversation? Today I noticed the delightful feel of cotton gauze. Baby dresses, sleep sacks and hand towels. It's a little bit scratchy but in a soft way. I think the last time I wore gauze was in high school - an embroidered peasant blouse. For as hot as it has gotten in the past couple of days, I think gauze should be the fabric choice of all of us. Tell me, did you have your Horton ears on today? Sweetie used to facilitate a caregivers' support group via teleconferencing. He never had many callers. Even I backed out after awhile, cause I needed to spend more time with Dad than on the phone. He did have a regular caller, though, one of his coaching friends. who faithfully called in every Tuesday to discuss how hard it was to parent his grandchildren. Their mom, his daughter, wasn't doing a very good job. Like many of the boomer sandwich generation this guy and his wife stepped up to the plate to give their grandchildren a stable home. Just when they were about to enjoy retirement, their lives changed. I don't think they'd have it any other way, but that's not to say it wasn't a difficult situation. Sweetie passed out business cards around town, advertising the support group. The group calls ended a few years ago but apparently his number is still listed on a few caregiving websites. Last night, he got a call. Thought it was a wrong number at first. Then he got to thinking about it an called the number back. The caller had been trying to reach the teleconference which of course was no longer available. She somehow tracked down Sweetie's cell phone number. It didn't take long for him to figure out this woman was really in need of some help, someone to talk to, someone to listen to her. She's been caring for her mother with Alzheimer's for 6 years. As the disease has progressed, she's had to quit her job to be with her mother round the clock. I was sitting next to Sweetie, listening and offering suggestions. He passed the phone off to me cause I had my computer on and was furiously trying to find some caregiving sites I know about. I gave the woman the information I had and the names of some people to call. And when she said thank you, that could have been the end of it. But I heard these words come out of my mouth .... would you like to talk about it? Just giving her permission to vent eased her burden a tiny bit. I could hear it in her voice. I could remember being in her shoes. Being tired. The kind of tired that seeps into your bones. And scared. The kind of scared you get when you don't want to face certain facts. Like having to let go of the parent you used to have for the parent you have now. Like having to be the parent when all you really want to do is climb up in your momma's lap and have her tell you everything's going to be okay. Season that with a dash of anger, a pinch of frustration, and a hand full of "what's next." You get the picture. When I said I'd be happy to talk to her, I knew I was offering a lifeline to help her stay afloat until she could catch her breath. We cried a little. Even laughed some. Then said goodbye. I hope she slept a little better. I don't know anything about the alignment of stars, or how karma works. But I'm pretty sure there is a Divine power that connects us all together. Yesterday I was in the right place at the right time when people wanted/needed to share what was on their heart. And I knew enough to practice the fine art of listening and validate what I heard. I learned how to do that from Sweetie. In a way we'd come full circle. 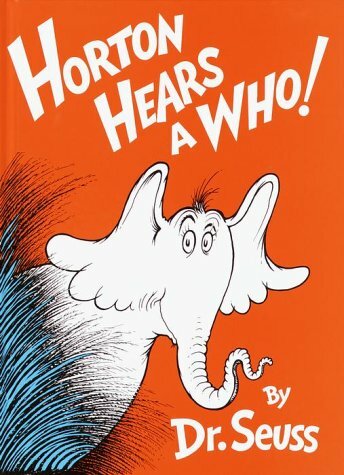 Remember Horton the Elephant and those big, ears listening to tiny little Whos that no one else can hear. What if we all had elephant ears? All the better to hear with, don't you think? Have you had the opportunity to listen lately? To turn off your phone or close your computer, and turn your full attention to what is being said? I think you'll find it's as good for you as it is for the other person. I'm noticing how organized new mothers are today. I don't think I ever wrote out a schedule. But then, when it comes to time management, maybe I've never been organized. I started my new nanny job today. I'm typing as "sweet Caroline" sleeps. When I got here, mom went over lots of directions; All neatly written down in a white notebook. Shades of my Dad! We walked into the kitchen to see where things are, conversation morphed easily from breast milk, to glass bottles, to dying. Mom told me about her dad's 6 year illness and recent passing. Her grief is still new and raw. Her tears were as natural as the morning dew (yes, I was up early enough to see and feel the dew) glistening in the sun. She had a story to tell. Her story. I listened. I nodded. I noticed how I felt and empathized, but didn't cry. Her story did not turn into my story. Progress I think. When the subject turned to nursing homes/care facilities we were both on the same page. Women warriors who know that comfort and care for the ill, infirm, and dying is just as important as it is for maternity patients who bring new life into the world. I feel comfortable and at home here. Yesterday I noticed B and her Dad lying on the floor, face to face. She had been laughing at her own jokes for a few minutes, so Dad tried to capture it on his phone. I tried to capture the scene on my camera. It made me think about how far fathering has evolved since I was a baby. I wonder, did my dad every get down on the floor with me, or change my diapers? I'm sure my mom never left any of us in his care without a note from the Doctor. No away time for mothers of her generation. Dad did take a lot of pictures of me because he was in his photography phase when I was about 3. There's a picture of me up to my cheeks in a bubbles. I think the story is I had the mumps. Isn't that a father for you? His sick daughter relaxing in a tub and he thinks it's the perfect photo op. Come to think of it, I was pretty cute. Maybe I didn't have the mumps, just chubby cheeks. I noticed when B's mom came home yesterday how much she needed B to be as excited as she was. Now I'm not saying B wasn't pleased to know things were finally going to get back to normal. But I'm not sure she was ready for the slow-motion-run-down-the-beach-(or hallway in this case)-into-each-others-arms reunion. All her needs had been met. She was clean. I'm sure it didn't take long for her to realize mom was back in charge. We give our children mixed messages, don't we? We want them to miss us as much as we miss them. But we don't want them to have separation anxiety. I saw a picture somewhere, FB maybe, of a mom gorilla with her baby on her back. Do animal babies get separation anxiety? Do moms that have to leave them to find food, or take a 10 minute rest without someone hanging on them, miss them in the way human moms miss their babies? How do momma birds know when it's time to push their fledglings out of the nest? Do they worry? Do they cry? Do they beg papa bird to let them stay one more day? Or do they just give them a push and lay back in the empty nest that suddenly doesn't feel as cramped. Does she wait for the kids to come home for a juicy worm dinner? I thought about all the times in the coming years B's mom is going to have to "let go." Preschool. Kindergarten. First grade. Middle school. College. Ballet lessons. Girl Scout Camp. Spelling Bees. Soccer games. Sleep overs. Prom. Each release is difficult. Tears fall down a mom's cheeks, as the child runs happily to the bus without looking back. I seriously did not want to go. How could I go and leave her behind? Even leaving her in LA where an Islamic march celebrating the Ayatollah Khomeini was taking place just a couple blocks from her college apartment hadn't prepared me for letting her go and giving her the space to face what would come next. No crying, mom, she told me. How could I not cry? I cry thinking about it now. But I look back and see how important it was for both of us for me to let her go. To face her fears, her grief, her loneliness on her own. Only she wasn't alone. She was surrounded by people who loved her almost as much as I did. And that's what I said in a note to K last night. God made moms' heartstrings out of elastic. They stretch as far as they have to so that even when mom can't be there in person, the child (even if she's an adult) is never without the love that flows between them. It's a hard truth. Our children survive without us. Better, probably, that we do without them. And they do that, I believe, because of love. Love that knows no bounds. Can't remember the last time I was up at 5:50 and heading for work by 6:15. Usually I'm not a morning person. Okay, I'm never a morning person. But I had a date with Miss B who proved to be much mellower today. Didn't want to stay on schedule and didn't laugh until bath time when I was ready to leave. I couldn't help but notice the smile on her dad's face when he tried the magic words - Go! Go! Go! - and B laughed out loud. I got tears in my eyes as I closed the bedroom door. B was sitting in her dad's lap while he read her a bedtime story. Sweetie and I went out to dinner. On the way back to my car, I passed this rusted drain pipe stuck to a building. I would have walked on by, but I caught a glimpse of green. Some plants had sprouted and were getting just the right amount of water as it dripped from the pipe. Sometimes all it takes is a little sun, a little water, and a little perseverance to bloom. Where have you bloomed lately? Today was a first for me and Bella. Her mom went off for a girl's weekend so I stayed with Miss B until her daddy came home. I've got to say, everything went like clock-work, give or take a few minutes! Ready for Bella to go! go! go! You'd have thought I was Jay Leno, or something! So of course, I did it again. And again! And again! And each time B laughed harder and harder. Adding squeals like babies do. OMG! I felt like the funniest person alive. When Dad came home it was time for cereal. I made a bit of a mess, but Miss B ate the whole thing! She was a little slow with the bottle, but between Dad and me, we got most of it down. Then I said my poem to her again, and dang if she didn't start right back up laughing. Over and over again. Dad had never heard her laugh like that. We tried to Facetime mom, but I think she was tired of laughing by then. Today I noticed how the sweet, sweet sound of baby laughter made me laugh. And I noticed how peacefully Mary slept when I went by to see her. It must have been hard with the TV blaring for her roommate. I sat next to her bed and listened to her breathing. I'm glad she was getting some rest. And I noticed what a good pray-er my Sweetie can be. And how good frozen pizza is when you haven't snacked all day. May laughter be your prayer tonight. I did not visit Mary today. I didn't realize til the day was mostly over, but I really needed the break. Instead I played (some might call it work) with sweet, sweet Bella. When I got there, her mom had just put her down for an afternoon snooze. Miss Bella is playing hard ball when it comes to going to sleep on a schedule. But I've noticed that the I'm-the-boss-you-can't-tell-me-when-to-go-to-sleep time is getting shorter. She gets her pacifier and a pat or two. Then she's left alone to a) go to sleep b)play or c) fuss. She gets 15 minutes to self-soothe. If she's not asleep the adult goes back in, replaces the pacifier, gives a few pats and leaves. Since I was on duty, I waited the allotted 15 minutes, watching the kicking, squirming, fussing on the monitor. Bella had just about worked up a full head of steam when I walked in to settle her down. Oh how I wish I had a picture of that face. Seriously folks, she gave me a smile that would melt the heart of the meanest person on earth. Gone were all traces of fussing. Her eyes said it all - "My savior!" It was all I could do to keep from laughing. I was good. I gave her the pacifier and patted her, then left. Let me just say it was not easy. Last week I watched as Bella reached for her pacifier and tried to get it to her mouth by herself. I could almost see her brain synapses forming. Over and over again she'd pick it up, turn it this way and that, fling it across the bed, or cover it up with her blanket. Every so often it actually made it to her mouth. Over the weekend Bella's parents decided to make things a little easier on her - okay, on them. Who wants to keep getting up in the night to replace a pacifier? They did what any sleep deprived couple would do. They went out and bought a handful of paccies, so no matter how she flipped herself around there would be one close by. Tonight I noticed my new idea of pure bliss is a freshly bathed baby smelling of Johnson's lotion, surrounded by a gaggle of duck binkies. I didn't post anything yesterday. Not because I didn't notice stuff. But because the stuff I noticed made me so angry and sad and crazy all at the same time that I pretty much lost my cool. Losing my cool is one thing if I'm home alone. Doing it in a public makes it even worse. I don't which was worse the outburst or the embarrassment afterwards. Well guess what. She started to poo. and poo. and poo. Mostly unable to get out of bed without help and help was not always around (like 1 hour past the first call) she pretty much had to recline in her own mess. So while I was there visiting, she was regaling me with these stories while she continued to cramp and other stuff. When the aide came in, she was not what I call gentle. I wanted to grab up my friend and take her to the shower. She needed to be scrubbed from head to toe. I just happened to have scissors in my purse. I don't normally carry scissors, but I'd been at the Post Office so there they were along with packing tape and a giant marker. I decided to take wash cloth matters into my own hands. I grabbed the one clean towel from the bottom drawer, whipped out my scissors and began to cut it into 8 pieces. Mary would have a clean cloth every day for a week. Just as I finished, in walks the nurse with a washcloth. Her eyes got big and she looked at me like I'd defaced the Lincoln Memorial. I wanted to say wave the scissors in her face and say "stand back, I'm a towel cutter." Instead I simply stated I did what my friend needed so she could eat. As the nurse began to lecture me on what I could and couldn't do to their property, I began to cry. I told her I understood everything she was saying, that I was sorry, but I'd just about had it watching my friend suffer the indignities she'd suffered today. Mary was uncharacteristically quiet. But as I grabbed my things to leave before I got any more embarrassed, she began to fuss about the eye drops she hasn't gotten since she's been there. Eye drops? Please don't leave me, she cried. I can't eat my dinner by myself. I looked under the magic hat and found an egg salad sandwich, some creamed corn and some orange slices. I gagged. I had to kiss her goodbye and leave her to her own defenses. No, her dear son could not make it in to check on things. I shook and cried the whole way home. Sweetie got an earful. Then my sister. This morning, I was still upset but knew I had to make amends. I shouldn't have cut that towel. I bought a new one, wrote out an apology and left it for the nurse who was not on duty today. I'm still embarrassed. I'm still boiling over. But it's time for me to let this go. As I left this evening, I heard another family member say, "I'm not happy about this." Good golly I wanted to give her a high five. My friend Terri's son, Josh Urban, has been on a one-man journey to find good in the world. He plays his guitar, sings in train stations, VA hospitals and elementary school. Good is out there, one just has to look for it. Sometimes closer than others. Today when I saw Mary, lying in bed dressed in purple, looking tired, but relaxed, I thanked the guardian angel who had come in to help her. No, she still hasn't had a shower. But "Jackie" treated her with dignity and respect. I've got to be grateful for that. I noticed today, how supportive you have been as I tell this seemingly-never-ending-saga. Thanks for your comments and understanding. Today, I was reminded of how delightful children can be. I saw future. I sat in the very back pew at church. I find I'm pulling farther and farther away and not sure why. I don't think it's God I'm fleeing from. Perhaps the place no longer feels like home. I don't want to cling to the past but I don't know how to move into the future. From the back row I watched a little boy, 2 years old I think, sit quietly, then clap some, then raise his arms, do a little jig and say alleluia. He's always been too cute for words, but seeing him today as he's coming into his own personality, well it was kind of like seeing just what God must have intended when he put children on this earth. Today was also a day to celebrate 4 high school graduates. I can't site the statistics, and the margin is narrowing, but the number of Hispanic high school drop outs is still high. The fact there are 4 graduates in our relatively small congregation tells me that their parents have done a wonderful job of instilling them the value of education and belief in something far greater than themselves. As I drove down the street to see Mary, I noticed a little girl riding a bike. At first I thought her mom was just running beside her. Then I realized, Mom was holding on to the bike as the little girl pedaled for all she was worth. I slowed down to watch. Over and over again, they tried. There was a tumble, but the girl picked herself up and got back on the bike. Mom was looking tired! Something about the whole scene touched me in a sweet place. In an effort to tell the "whole" story, I noticed how everything about Mary's nurse tonight, Priscilla, was the exact opposite of what I'd been bitching about yesterday. She knocked before she came in, asked if there was anything Mary needed, then stopped to listen - LISTEN - as Mary talked about her day. "Yes, Mam,"she'd reply when Mary stopped for a breath. "How old do you think I am," Mary asked, knowing no one is going to tell her she looks old as Methuselah. Well Mary's smile virtually stretched across her face. "I'm 92," she crowed, and puffed out her skinny chest. "For real?" Priscilla asked, first Mary, then me. "For real?" I'm not sure when I started crying. Tears trickled down my cheeks at the beauty and sweetness of the conversation. "Now don't you be afraid to call me, if you need anything," Priscilla told Mary as she walked out of the room. "That's what I'm here for." Tonight I noticed how sometimes a simple conversation is all the "nursing" someone needs. Do you see a connection in those snippets of my day? I see the Divine. In the dancing child, in the proud faces of students and parents, in the hand on the bike, and the nurse's gentle countenance. How did God touch your life today? I noticed today how angry I get when I walk in the front door of a certain SubAcute/Rehabilitation Care Facility. I wonder why nursing homes are called nursing homes? As far as I can tell there isn't a whole lot of nursing going on. Got a call from Mary today, she was crying and said she needed me. Guess you know I tore out of here like that tornado tore through Oklahoma. I was pretty worked up by the time I got there. But things didn't appear to be as bad as I expected. Poor thing needed to vent. Can't say that I blame her. I'm ready to start taking names. I start with Grace. To give her the benefit of the doubt, Grace and Mary had a run in the very first day. It took Mary a few days to a) settle in and b)manage her pain. She can be pretty crusty. Grace probably drew the short straw that day. I don't know how they do it. I couldn't. Still, it doesn't give them the right to ignore, walk away from, be rude to. Now since I didn't see any of Mary's grievances when they took place, I only have her side of the story. But here's what I do have. When I got there, Mary's food tray was in front of her. It looked coldish, but edible. The potatoes was all she'd tasted. She'd drunk 1/2 her glass of juice. As we talked Grace came in and carted away the tray, juice and all. A few minutes later Mary wanted something to drink, she's had a sore throat for 3 days. So I go ask for some. There's Grace with the trays stacked in a cart. She says, "I thought she said she was finished." She opens up the cart, finds Mary's tray, takes the juice glass from it (I saw that she did check the room #) and hands it to me. I said, "She can't have a fresh glass?" That had not even occurred to her. Wait a minute? Aren't there super bugs running rampant in places like this? There is a 12-step diagram how to wash your hands in the bathroom, but you can drink from a glass that's been piled in a cart with other trays? As I listened to Mary, I couldn't help but wonder if she will ever get to go home. Even if she's able, her old house would need a lot improvements to make it safe for her. I don't know about her son, but I'd worry about her being there alone. It's the being alone, that makes me think she won't go back. I doubt she can afford sitters. Isn't there such a thing as case manager, or patient advocate, or social worker that goes around and makes sure everyone is okay? Who explains what's happening? Who sets up plans? Who asks questions? That sandwich looks a little dry? Would you like some FRESH juice? Your teeth hurt? Well let's get you some orajel. A milkshake? Your nails clipped? Your hair washed? Someone to hold your hand? Soft music? Art work on the walls? Colorful afghans? Kitty cats? Hospital gowns that don't get all tangled up? Seriously, is this too much to expect? I know that some of the patients aren't in a position to communicate with a person like that. Well then, dammit, that makes it even more imperative that they have someone to speak for them. I'm pretty sure the whole thing boils down to dollars and cents. You've got to have money to get into the better places. Good, caring staff takes money. It takes money to add Glade air fresheners to every hall and room. It takes money to add massage therapy, music therapy, art therapy, aroma therapy, pet therapy to a patient's overall rehabilitation program. And if we're going to add that to the patient's welfare, let's add make sure the staff gets the same kind of therapy. Maybe what really has me upset is the fact that I can't do anything to fix the situation. Even if I won the lottery I could only make things better for a few people. When do we (the big general WE) say enough is enough? I don't know diddly squat about Obamacare. Maybe it's good. Maybe it's just another finger in a dam that's about to break loose. What does it say about our society when we stack our kids up in day care centers and our old people in nursing homes?